Have you seen any of these films? What are your thoughts on them? I’ve seen them all. Good picks. I would rate your first 2 a bit higher but hey, that’s just me. I didn’t care for Eden Lake and I totally can relate to the despair and frustration it leaves you with. Good point. Thanks, Victor. Yeah, Eden Lake was certainly maddening. It was a well-made film, but man, it just didn’t let up at all. 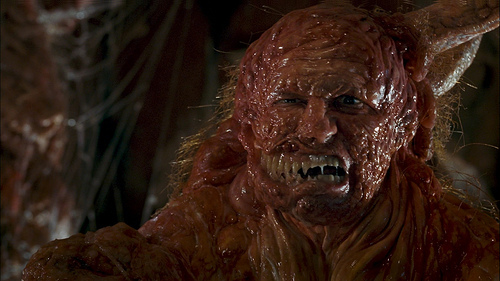 I really love Slither, I would watch it all the time but it’s really gross so I only saw it once, but it was so funny. Eden Lake is really disturbing movie, what’s horrifying is that I can totally see something like this happening in reality. Great point about Eden Lake. Something like that could absolutely happen, and it adds to the overall impact of the film. So punishing. I got a kick out of Slither. And agree to its roots going back to the 80s horror stable with its humor and gore. I’ll be mentioning another soon that had similar basis. Also great to hear that you caught up with An American Werewolf in London. I truly love and appreciate that one (especially its use of music, as you may have read at my blog). I do keeping hearing about Eden Lake. I may have to watch this sometime in the future. Thanks, Eric. Thanks again for the reminder on An American Werewolf in London, Michael. I really enjoyed that one. As for Eden Lake, it’s a well-made film but it sure left a sour taste in my mouth. Kind of hard to recommend it, honestly. An A. W. in London, good scares right there, and indeed impressive special effects. I haven’t seen Eden Lake, but didn’t mind Slither. The effects were very good in that, the story was like an old B Movie. An American Werewolf in London is a brilliant horror film, a real classic, the sfx and Werewolf transformation is the best ever! One of my all time favourites. Great to hear you enjoyed both of those films! I think An American Werewolf in London will grow on me with each viewing — it really was a fun movie. I agree. An American Werewolf in London is a real horror classic, great film to watch on Halloween! Eden Lake was one of the more unsettling movies I’ve seen in years. “Unsettling” is a great way to describe it. Not something I would ever want to watch again. American Werewolf in London is my favorite (and arguably best) werewolf movies out there. I can’t say I have seen too many werewolf movies, but it’s probably my favorite so far as well. Good stuff! Nothing but good picks here, Eric. Particularly Slither, which I think gets a lot less love than it really deserves as a gooey, icky, gross, delightful bit of body horror comedy, but I’ve also got to applaud the Eden Lake pick. That’s a very, very under-seen film and a really effective, grungy thriller. Plus, Fassbender is terrific (though Kelly Reilly is REALLY superb as the heroine here). Also can’t go wrong with London— it’s a classic. You know, I have to give credit to Eden Lake simply because it is such a well-made film, but it was a very difficult watch. I’m glad I saw it, but one time was plenty for me. Never even heard of Eden Lake before but Michael Fassbender is in it?? I guess he’s not so invincible eh? It doesn’t sound like a good film at all. Plus there are sooo many lakes here in MN, there might actually be one called Eden, ahah. Yep, seeing Fassbender’s name in the cast was what drew me to Eden Lake initially. It’s not a bad film, just not a particularly enjoyable one. The only one of those I’ve seen is An American Werewolf in London, which surprised me as well with how good it was. One of the better horror films around, I think. Yeah, I really wasn’t expecting much from that one, but it was a lot of fun. Glad I finally saw it. I saw Eden Lake about 2 months ago after reading that it was a worthwhile horror flick. It definitely did its job in the way of being a horror film. But I was so disappointed by the fact it failed to release any catharsis for me. I was on the edge of my seat the entire film, and as gets to the end, I needed some relief and I never got it. Terrifying, but did not like it. I am with you, not something you would ever want to recommend. However, I have had many conversations about it, so I can’t say that it wasn’t an extremely effective film. Hi Rob, thanks for stopping by. I agree with you 100% here. Eden Lake certainly nails what it strives to accomplish, but I was hoping for some sort of redemption. It’s not often that a film can leave me feeling so angry afterward. Fun fact: Slither was directed by a St. Louisan. Huzzah, St. Louis! An American Werewolf in London is a movie I was awfully “meh” about the first time I saw it. And then I saw it a 2nd time, on the big screen, and went bananas for it. Now it’s one of my favorite horror-comedies. I would love to see An American Werewolf in London on the big screen. Would make for an excellent midnight screening.